These are simple to make because you bake them in the microwave. Then paint with craft paints. Use a gloss or satin spray to give them a nice finish. Add a little glitter over the sealer if you so choose. 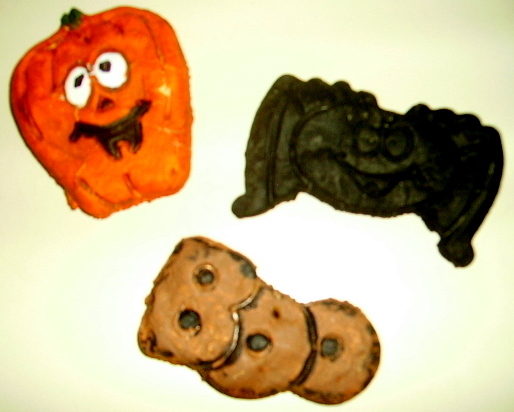 The recipe for the salt dough and the directions for this project, “Halloween Ornaments,” are in the Halloween Projects Gallery in the sidebar. This entry was posted in Halloween and tagged easy halloween crafts for kids, halloween crafts, halloween crafts for kids, halloween ornaments, halloween projects for kids, ornaments to hang. Bookmark the permalink.